10 8:38 Gosh, I was counting down the quarter miles here. 13.06 0:27 Not much left at the end. 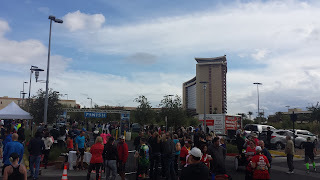 Back in about 2011 or so I remember reading about the Summerlin Half Marathon in Runner's World magazine -- or maybe it was a Las Vegas newspaper. Either way, I was intrigued about running a half marathon in my favorite state near one of my favorite cities. In 2013, I finally made the plunge and decided to run the race. Since then, whenever spring rolls around I debate on whether I want to make the 5 hour drive down to Vegas and run the race. In fact, in 2014 I came down but couldn't run the race on account of a calf strain. This spring, though, I took the plunge after seeing a discount coupon come in and nothing on my calendar for mid April. I am always looking for an excuse to go to Vegas, so figured why not do it this year? I also got some more good offers from local hotels in the area and the trip was planned. 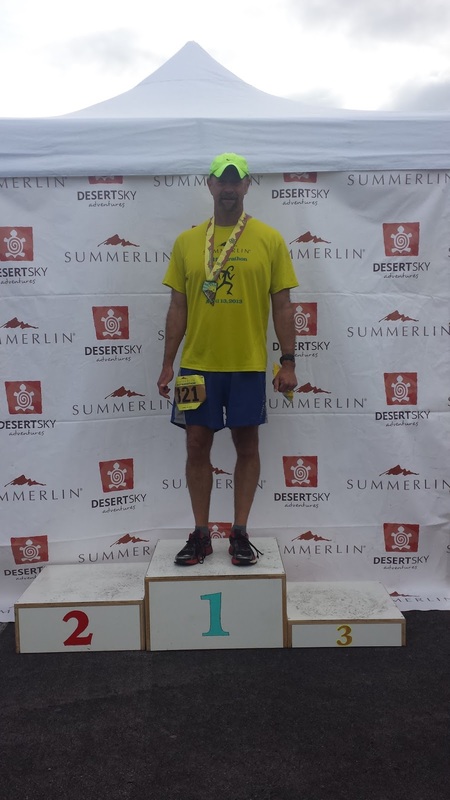 I wound up picking up my packet on Saturday afternoon. It was easy in and out. 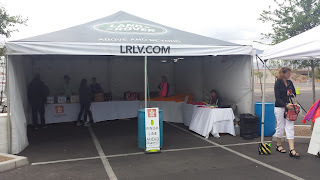 Although I missed having the packet pickup at the Rampart Hotel and Casino (where I was staying). I think they've outgrown that environment and now the pickup was held in the parking lot behind the Red Rock Casino. Definitely less ambiance but easy parking. The night before the race I ate a veggie burger at an Irish pub at the Rampart and didn't kill myself at any buffet. I slept HORRIBLY the night before. I think I was over stimulated and had some pre-race anxiety. If I got more than 4 hours of sleep I would be surprised. I did get up at 5:30 for the 7 am race start. I ate some food and was out the door before 6 am and made the 12 minute drive to the Red Rock Casino. The 600+ runners were slowly milling their way into the parking lot. There was plenty of spots, however and they had volunteers guiding us in. I cycled through the bathroom and the race started right on time at 7 am. I didn't have a lot of goals for this race other than to try and enjoy my experience. 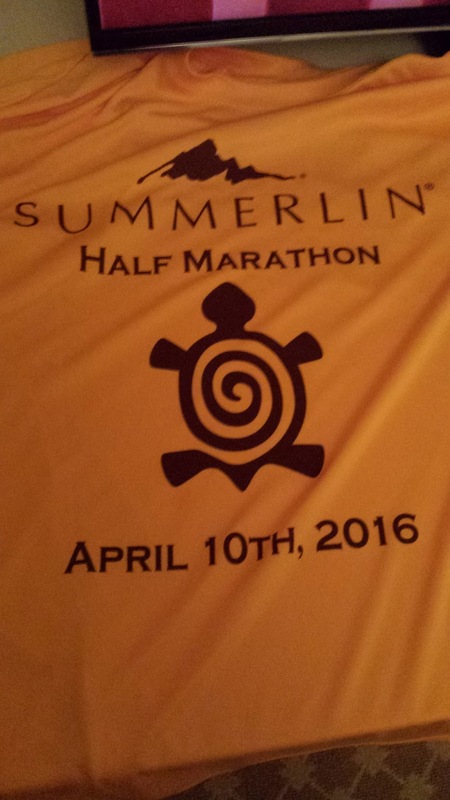 I was feeling a bit fatigued from last week's half marathon and I knew the course was going to be hilly. I had hopes that I would be able to run something in the low 1:50's. I had slightly lower elevation than what I am used to but the hills in Summerlin are pretty relentless. I figured I'd try to run even splits as best as possible and start off conservatively. A 1:50 is about 8:30 minute miles. I hit that pretty much spot on for the few miles. It felt almost too easy even though there were some hills almost from the get go. I was hemmed in pretty well to at the start. Although I was able to run my own pace after about half a mile or so. Again, this was good. As someone who starts off pretty quickly I was happy to be forced to go slightly slower. While this course was new, compared to the one I did in 2013, I did recognize some of the sections that I had run on previously. 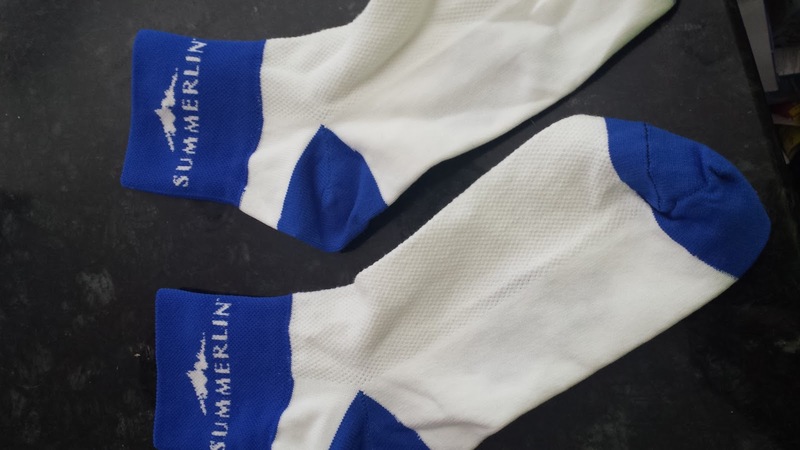 Summerlin has a really scenic bike / walking trail that snakes its way around the city and we'd jump on that from time to time. There weren't a lot of long stretches of bike trail, as the race was primarily held on coned-off city streets. I really have to hand it to the organizers... I was wondering how we were going to run along the streets of Summerlin but they had us very safe and on city roads there were police handling the intersections and an entire lane coned off for us. I was dressed comfortable given the situation. I saw a LOT of people over dressed. It had threatened rain but it wasn't rainy at all and I wound up ditching my $1 gloves at about mile 3. Up until the half way point, I was largely on target for a really good race. In fact, I figured I could hit 1:50 or so despite the growing fatigue in my legs. However, I was in for a cruel surprise. Around mile 7 the hills just got really relentless. I thought they were over after ascending a freeway overpass. However, that was just the beginning. From slow and steady grinds to "oh crap, I have to climb that" the next 2 or 3 miles were just ugly. I saw my 8:40-ish pace disappear into marathon shuffles. The course had also left the primary Summerlin residential area and I found myself running along the 215 freeway on a bike trail. There wasn't a lot to look at and the gradual climb was a bit of a sufferfest. By the time I reached the end of the hills I was pretty well gassed and I figured I could kiss my dreams of a low 1:50 in the trash. I did manage to pick up the pace in the last few miles as the course got decidedly more downhill. I also got to see a newer part of Summerlin. The smell of the course was also great too... the trees had a certain scent to them which was a pleasure and definitely unique. 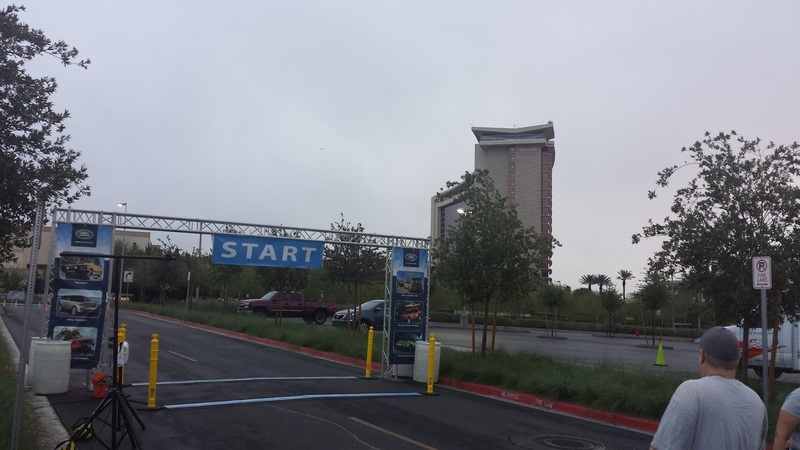 The last mile was along the 215 again and I was thrilled to cross the finish line. The hills had just taken so much out of me and while my downhill miles aren't that bad, I felt a lot worse then the times indicate. 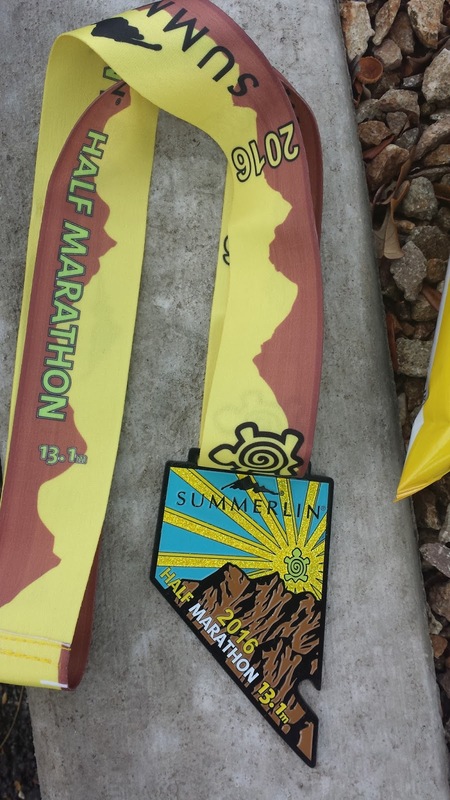 As usual, the race outdid itself with its medal. I love their 2013 edition and this one is also going to wind up in my prize-collection. It is heavy-duty and well designed. The shirt was a little on the ho-hum side -- not a fan of the color, but it is a quality tech-shirt that I'll definitely wear. As far as scenery went, it was a residential run. I loved the sections on Summerlin's bike trails and some of the new subdivisions were really nice to run through. I certainly remembered sections of the course from the 2013 edition as well. Water stops were pretty well maintained. A lot of the cups were barely filled though and I tended to get more water than Gatorade. Not the end of the world in a half marathon though. They had bathrooms at each of the water stops that were spaced out approximately every 2 miles. The course markings, according to my Garmin, were mostly on. The 5 mile marker was at 5.4 miles though. I feel the course was accurate despite a 13.06 distance on my Garmin. There were a few hairpin turns that I suspect the Garmin cannot account for. The course was also well marked and again, major hats off to the organizers, volunteers and police force for marking running through intersections not a problem at all. Post race food was water, chips, protein bar, bananas, fruit, and muffins. I didn't see any Gatorade or sports drink in the finish area. A little more would've been nice. I understand why the race is fairly pricey. Getting permits, police support and the fancy medal definitely require an investment. Overall, I was disappointed with my time. I do have to let myself off the hook a little bit: I am coming off a series of races that have left my legs semi-dead and the course was challenging. 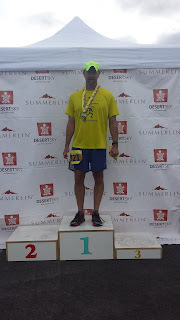 I am glad I did this race though and had a lot of fun doing it. I sort of prefer the 2013 edition of the course, but this is a nice substitute. 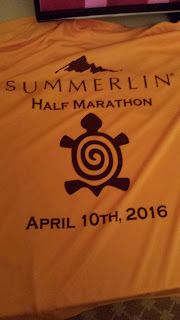 The Summerlin Half Marathon continues to grow and if my plans can take me to Vegas in April, I'll continue to jump into it.